This year’s Arctic campaign distinguishes itself from previous ones by welcoming visiting teachers from the United States, Denmark and Greenland. 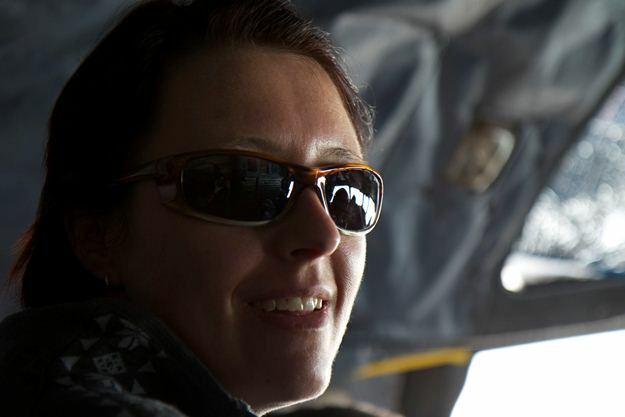 Through cooperation with the U.S. Embassy in Copenhagen, the Danish Ministry of Education and the National Science Foundation’s PolarTREC program, five teachers—two from Denmark, two from Greenland and one from the United States—were chosen to join Operation IceBridge in April. These teachers will be embedded with the IceBridge team for several days, staying with IceBridge personnel in the KISS facility, riding along on survey flights and attending daily science meetings. The teachers will trade off days flying and days on the ground during their stay, with activities such as a glacier field trip and excursion to a nearby fossil site. Peter Gross is a physics and math teacher at the Roskilde Technical Gymnasium in Roskilde, Denmark. Gross uses the science and math skills he gained in his education and during his time as an engineer and his tremendous enthusiasm for teaching to educate a new generation of science, technology and mathematics (STEM) students. Erik Winther Jakobsen teaches at the Aalborg Gymnasium in Aalborg, Denmark, and has for the past several years worked on the subject of human environmental impacts and climate change. While working on and teaching this subject, Jakobsen noticed a need for more reliable time-series data on ice sheets, something Operation IceBridge is working to achieve. Sine Madsen has been teaching biology with an emphasis on climate change in the Arctic at the Building and Construction school in Sisimiut, Greenland, for the past 10 years. Madsen hopes to use her new knowledge about how climate is changing in the Arctic and share these insights with her students back home. Tom Koch Svennesen is a chemistry and comparative religion teacher at Aasiaat GU in Aasiaat, Greenland. Svennesen has seen firsthand how the ice in Greenland has changed in recent years. 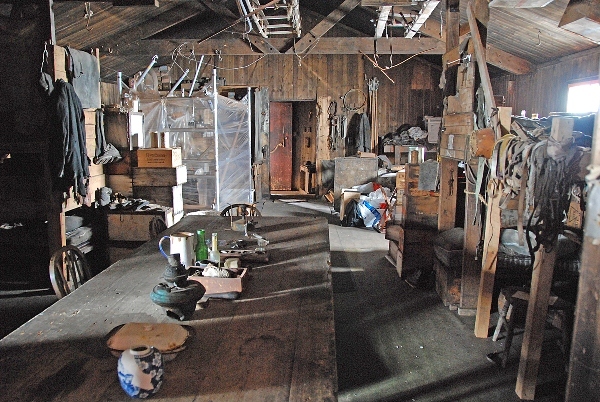 In his time teaching in Greenland, he has faced a variety of challenges such as the disadvantages faced by Greenlandic youth whose parents don’t speak Danish and thus have a harder time learning the language used in Greenland’s education system. 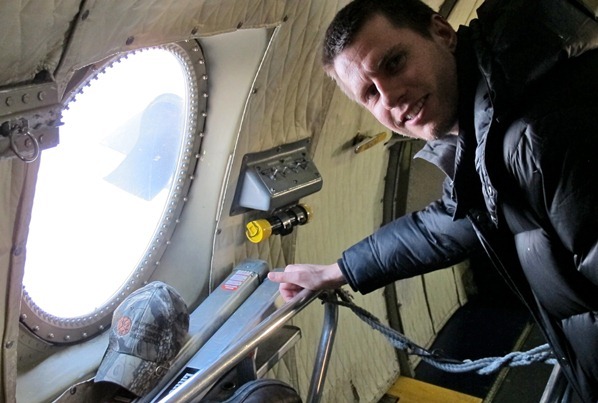 Tim Spuck joins IceBridge as part of NSF’s PolarTREC program, an effort designed to embed science teachers in with scientists doing polar research. Spuck teaches science in Oil City, Penn., and aims to use what he’s learned through the program to better reach STEM students in his school. The Greenlandic and Danish educators arrived in Kangerlussuaq on April 13 and leave on April 19. 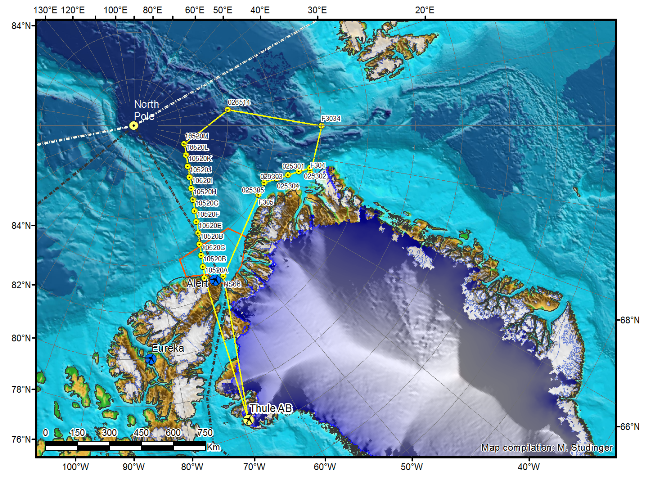 Spuck got there the following day and will remain with IceBridge until April 25. After landing, teachers had a chance to see the town, buy groceries and settle into their rooms in the KISS facility before heading to the airport to greet the returning P-3. After the April 13 flight, the teachers sat in on IceBridge’s daily science meeting, where they introduced themselves to the team and decided who among them would be the first to join a survey flight. DMS team member James Jacobson (left) explains the basics of the P-3’s Digital Mapping System to Tom Koch Svennesen and Peter Gross. Credit: NASA/Jefferson Beck. On the morning of April 14, Svennesen and Gross boarded the plane, and after a quick safety briefing by the flight crew, strapped into their seats for the Helheim-Kangerdlugssuaq Gap survey. On this flight, the P-3 would quickly transit the ice sheet and start a series of roughly north-south runs across several glaciers on the east coast of Greenland. This survey, informally known as mowing the lawn, would start close to the shore, gradually moving inland with each pass. This flight yielded a large amount of data for IceBridge scientists and many sightseeing and photo opportunities for everyone on the plane. Unfortunately, the flight had to be cut short a little early due to concerns about a possible fuel leak in one of the engines. The P-3’s flight crew noticed streaks coming from the engine that could have indicated a leak and the pilots returned directly to Kangerlussuaq as a precaution. After an extensive engine test, the flight crew determined that what they saw was water from melting ice that caused the steaks. On Sunday the airport was closed, meaning a well-deserved day off for the P-3 flight crew. Without a flight, many IceBridge people, including the teachers, took advantage of their time on the ground to visit the nearby Russell Glacier. The trip gave teachers and scientists a chance to interact, take lots of photos and see part of the Greenland ice sheet up close. That evening, after a busy and windy day of hiking around the ice, everyone gathered for a group dinner in the downstairs kitchen of the KISS facility, which gave teachers more opportunity to learn from scientists and each other. 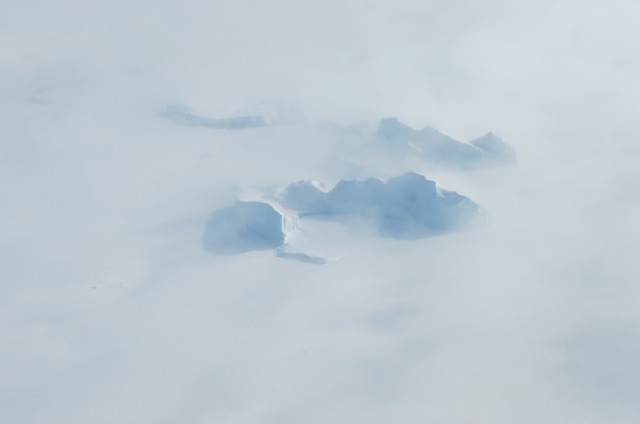 Early on April 16, Madsen, Spuck and Jakobsen—who didn’t get to fly on Saturday—joined the IceBridge team on another flight, this one a grid survey of glaciers in the Geikie peninsula. At the last minute, an extra seat opened on the P-3, and Gross joined the group while Svennesen stayed behind to work on the website he runs for his students. Despite a fair amount of cloud cover for part of the flight, this survey was another in a long line of IceBridge successes, with ATM only losing about five percent of its data due to clouds. 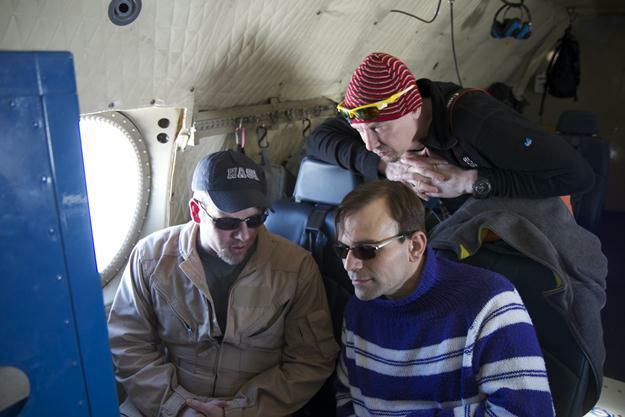 When asked about his favorite moment during the flight, Jakobsen said he enjoyed seeing the interesting geology of the Geikie peninsula and, of course, the pitching maneuvers used to calibrate the radar. 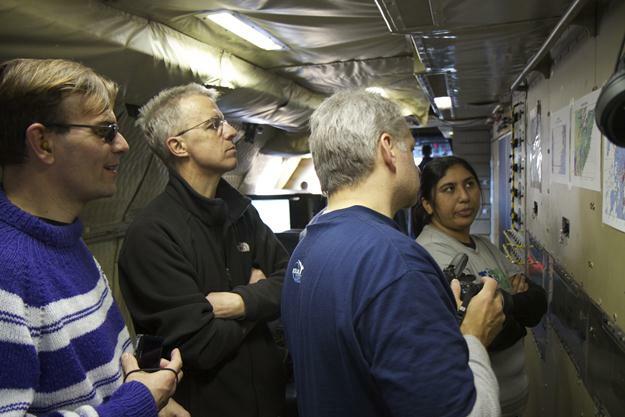 On each flight the teachers take advantage of opportunities to talk to the science and instrument teams on board. Shortly after takeoff on both flights, ATM program manager Jim Yungel gave a detailed explanation of the inner workings of the Airborne Topographic Mapper and the science behind using lasers to determine ice surface elevation from the air. They also got to learn more about the Digital Mapping System, gravimeter and magnetometer, and the P-3’s various radar instruments. The IceBridge experience continued even on non-flight days. During and after a group dinner on Sunday, teachers talked with several members of the science and instrument teams, learning more about IceBridge’s instruments and polar science. Having educators working with scientists and living in the same facility allows for many of these informal question-and-answer sessions, which are often more enlightening than a lecture or information session, and gives them a taste of life as a polar scientist. The experience has also given these teachers new ideas for ways to teach science to their students in ways that are based on real world examples. 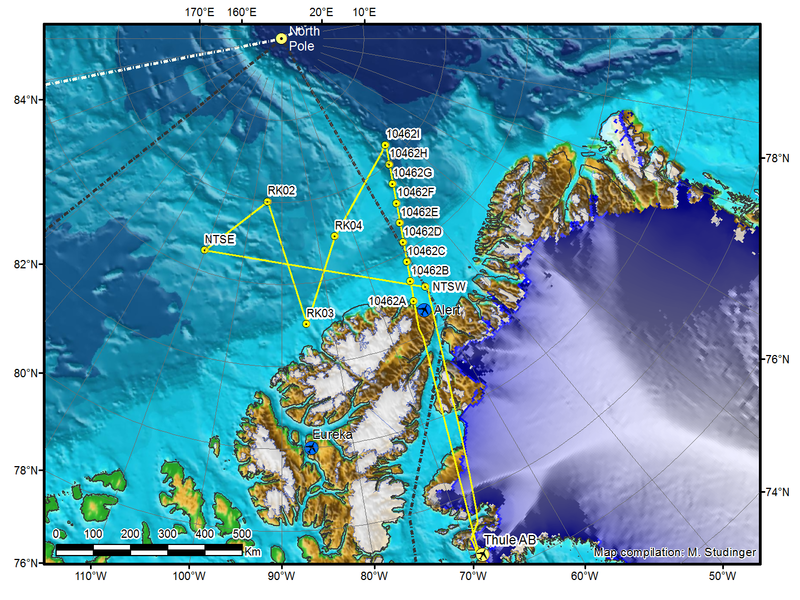 The transfer of IceBridge’s base of operations from Thule to Kangerlussuaq normally marks the end of sea ice surveys done by the P-3 for the campaign. 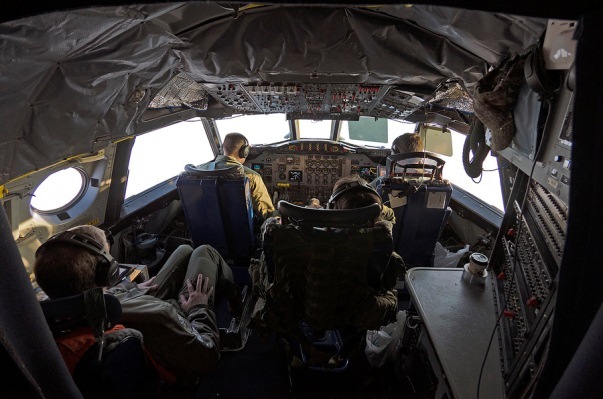 At this time, scientists on the P-3 change their focus toward ice sheets and glaciers, while researchers aboard the Falcon jet using Land, Vegetation and Ice Sensor (LVIS) will continue studying sea ice. But with starting the campaign with a transit to Alaska and beginning operations in Kangerlussuaq by crunching data on the ground while the P-3 is in Wallops being repaired, this year has been anything but ordinary. I’ve been asked to give my views as a newcomer to IceBridge and first-time visitor to the Arctic and I’m happy to share. First, I have to state that while I have a basic background and interest in science, I’m not a scientist by training. My role as a communicator is not to make scientific discoveries, but to spread the word about them. Part of my job as IceBridge’s science outreach coordinator is to help bridge the gap between what scientists find and what the public understands. Being outside of the science of sea ice gives me a different perspective on things. I’ve been keeping up with news from the Arctic campaign, but it wasn’t until actually riding along on a sea ice flight that I felt I knew what was happening. Being with scientists as they gather data and sharing the flight experience with them will hopefully help me improve IceBridge’s educational and public outreach efforts. I arrived in Kangerlussuaq on April 9, the same day as the P-3 returned from Wallops. While flying from Thule the week before, the P-3 started having issues with one of its engines, something unavoidable with the workload and conditions the P-3 is subjected to. In the interest of safety, the pilots shut the engine down and flew directly into Kangerlussuaq. 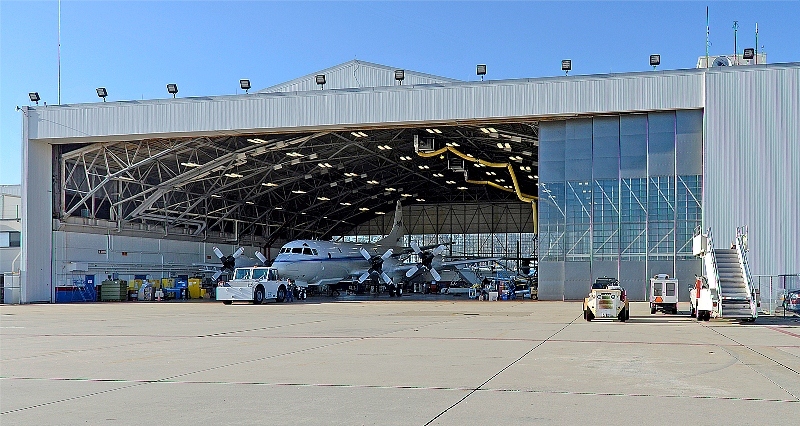 After a one-day delay because of weather, the P-3 made its way back to the Wallops Flight Facility in Virginia for an engine replacement. The P-3’s return flight to Greenland coincided with my scheduled arrival there, so I was extended an invitation to ride along. Unfortunately, this didn’t work with the arrangements for my commercial return flight, so I wasn’t able to go. I arrived in Kangerlussuaq on an Air Greenland flight Monday morning with enough time to unpack, check my email and buy some groceries before joining others at the airport to see the P-3 arrive. Bright and early Tuesday morning, I joined 23 other people in braving the 12 degree Fahrenheit weather to board the P-3 for one last sea ice flight along the east coast of Greenland that would put us on an intersecting path with the NASA ER-2 carrying MABEL. At this point in the campaign, IceBridge normally flies glacier surveys, but weather conditions made that unfeasible. 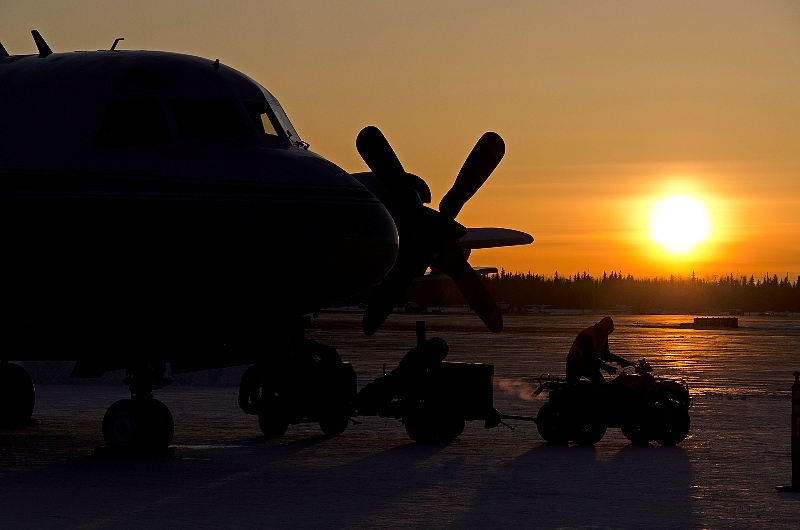 This flight was another in a long line of successful sea ice surveys and joint operations with other aircraft. IceBridge has flown 15 sea ice flights, including several along CryoSat orbits and two joint flights with aircraft from the European Space Agency as part of CryoVEx, their CryoSat validation campaign. Aside from the highly successful joint ESA/NASA flights, this year’s Arctic campaign stands out as completing several more sea ice flights than previous years, covering a distance greater than the circumference of the Earth around the equator. In total, IceBridge has collected huge amounts of sea ice data from instruments like ATM, DMS and the new KT-19 temperature sensor used for sea ice lead detection. And this data is just sitting around waiting to be processed. This year IceBridge scientists are working to build a quick sea ice product from information that’s only days old. If this proves successful, it has the potential to improve sea ice forecasts and statements for the general public. 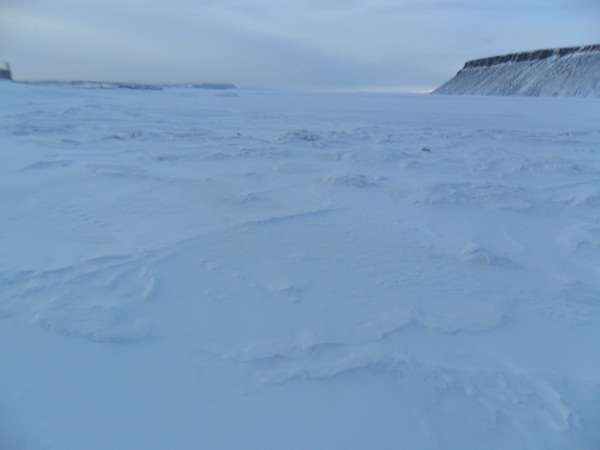 IceBridge scientist Nathan Kurtz talks about his work with sea ice and the quick sea ice product in his earlier blog post. Having successes like these early on sets the bar for the rest of the campaign, and after hearing about IceBridge’s success for several weeks, I now get the chance to witness it first-hand. 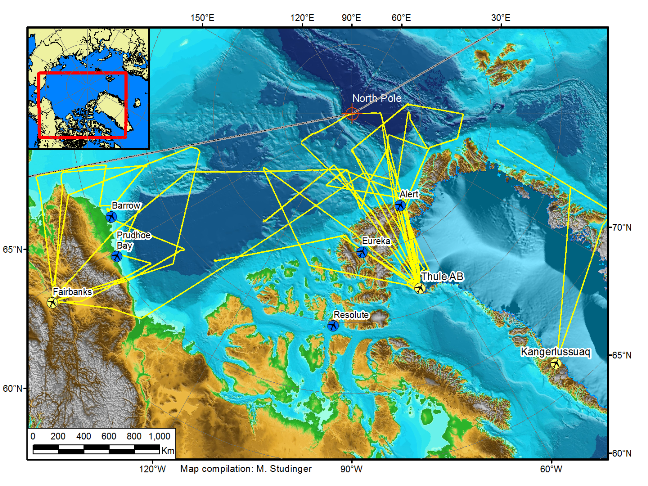 I’ve been hearing about IceBridge’s campaign successes since operations began in March. Knowing I would join the team in April and get to see these successes first-hand was very exciting. Being there as things happen promises to be a great experience, and I can only hope to avoid getting in the way. On the morning of my first survey flight, I strap into my seat. I’m not entirely sure what to expect, but I’m ready to see IceBridge at work. I am in some ways grateful that my first flight was over sea ice. Although it may have been a letdown for those who have flown many sea ice flights this year already, I was glad to have a relatively gentle introduction. Compared to glacier surveys, sea ice flights are smooth and easy, with no crosswinds coming out of fjords and far less turbulence. As I walked around the cabin I saw members of the IceBridge team working diligently, recording data and making necessary adjustments to their instruments. 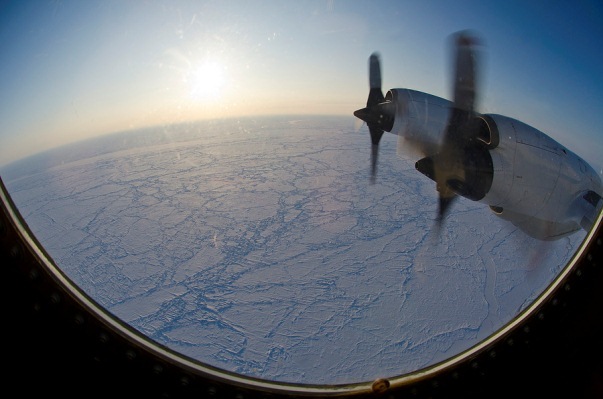 I also looked out the P-3’s side windows to watch sea ice as we passed 1,500 feet overhead. The flight wasn’t all straight and level though. 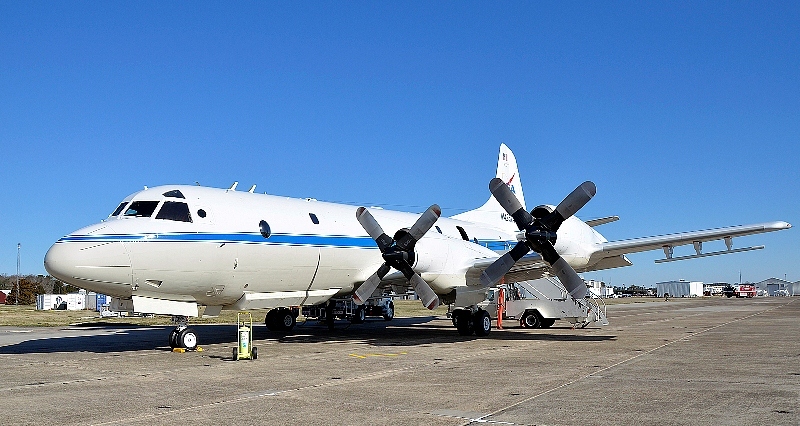 The pilots put the P-3 through a series of pitching and rolling maneuvers at higher altitude for instrument calibration. The up and down parabolic arcs and resulting feeling of lessened gravity seem to be a favorite, bringing smiles to the faces of both novices such as myself and IceBridge veterans. Several hours later we returned to the airport, with the bulk of the team ready to get off the plane and warm up. During the return leg a mechanical issue caused the plane’s climate control to start blowing cold air instead of warm. By the end of the flight, it was around 40 degrees Fahrenheit in the back of the cabin and some bottles of water sitting on the deck were starting to form ice on the bottom. After landing we take a short break (to warm up) and then head off to the daily science meeting, where we discuss the day’s events and look at weather forecasts to make plans for tomorrow’s flight. The plan is to survey some of the eastern glaciers, which means a more turbulent flight for my second day on the P-3. I’m looking forward to riding along on as many flights as I can in the following days, and to working with the American, Danish and Greenlandic teachers arriving soon to participate in IceBridge. Synchronized NASA and ESA flights across Arctic Ocean — a success! 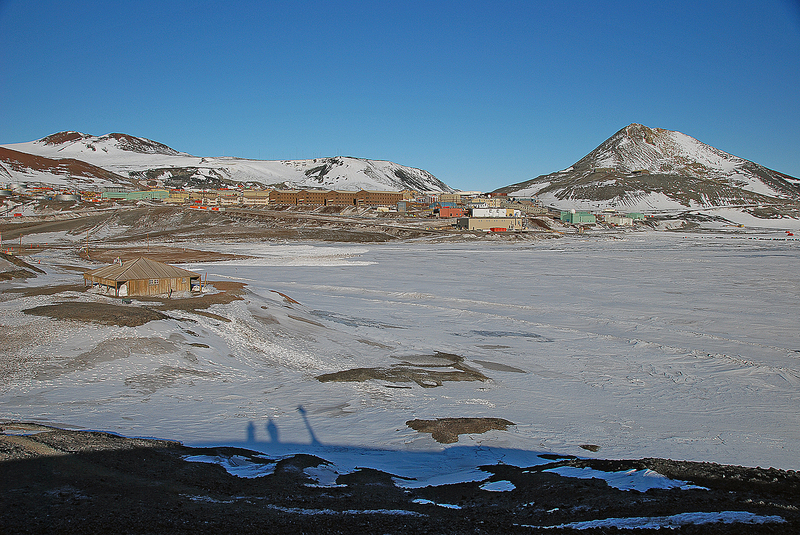 Monday April 2 has been much anticipated bythe teams in Thule, Greenland (NASA) and Alert, Canada (ESA). 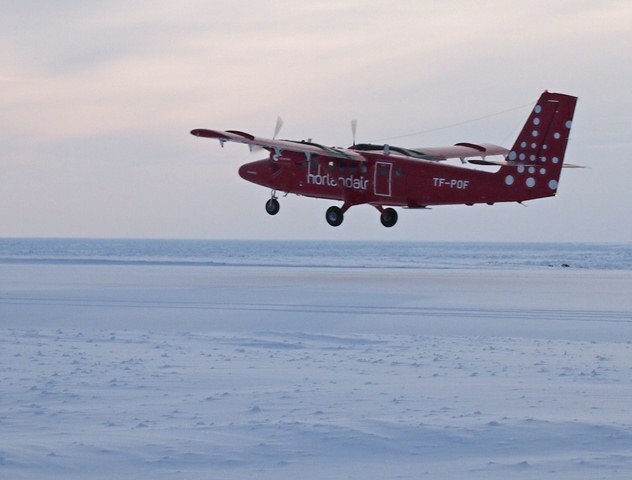 While the objectivesfor the day were clear – jointly fly with all available planes beneath CryoSat’searly morning pass over the Arctic Ocean – the execution of such flights is andalways will be a challenge. Flying joint multi-plane missions is arather daunting task. Departure and rendezvous times and locations need to becalculated and maintained to ensure that the instruments on the differentplanes will see the same sea-ice floes below (these move after all), flightaltitudes need to be established and maintained for safety reasons, instrumentsneed to be warmed up and ready ‘in-time’, somewhat grumpy firefighters need tobe coaxed out to the airstrip ahead of working hours to support an earlydeparture and the list goes on. With both teams committed to the flights,the first task early this morning was to check the weather forecast for theday. These proved to be good with temperatures of –29°C (–20°F) and generally clear skies; but not ideal! 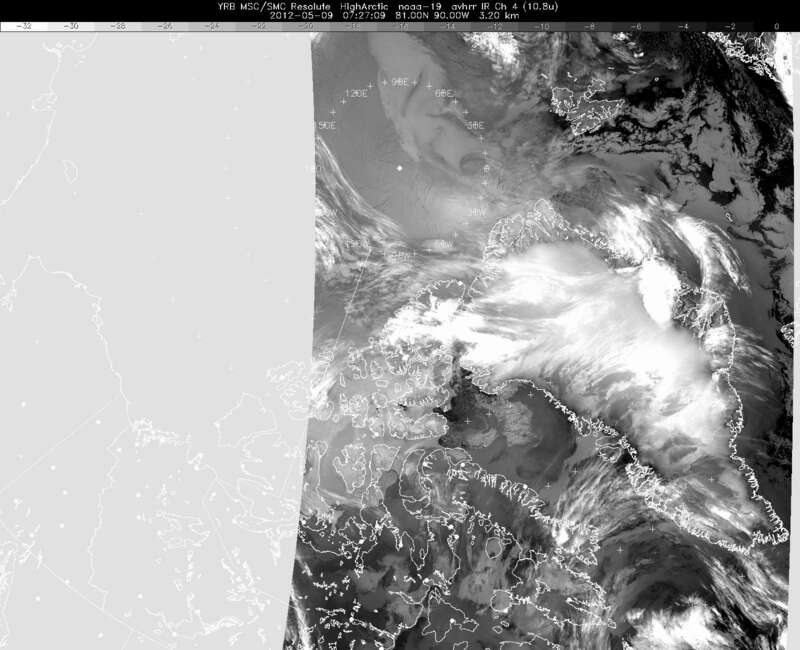 Some rather worryingcloud formations featured near the coast in satellite images. Nevertheless, after a quick phone callbetween the NASA and ESA coordinators (at a time before most people have yet toreach for their mug of morning coffee) the decision was made: it’s a go. From then on it there was a flurry ofactivity on both sides, pilots warmed up their planes, instrument teams checkedout their instruments, flight plans were programmed into the onboard computersand so on. The NASA P-3 plane was the first to go out, leaving Thule a full hour before the two ESA planes located closer to the track. On the tarmac in Alert there was the first casualty of the day – despite heroic efforts the EM-bird ice-thickness instrument could not be coaxed into life. The die was cast – the second Twin-Otter plane would have to go it alone and meet up with the NASA P-3. 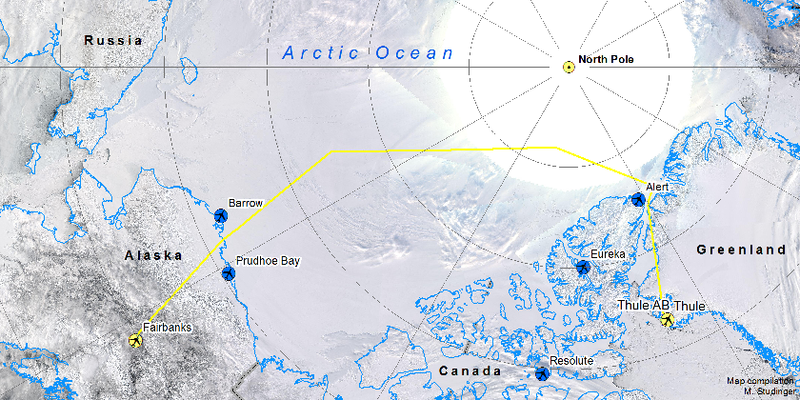 Around 07:30 (local time) the CryoSat satellite – always on schedule – ripped above the Arctic Ocean taking about one minute to race along the 500-km (310 mile) transect that would later take several hours of plane time to cover. At 08:00 both the ESA and NASA planes reached the edge of the Arctic Ocean almost simultaneously and headed across the sea ice flying exactly along the same line that CryoSat had just covered. The timing was so good that, for the first time, there was visual contact between the planes, a remarkable achievement! 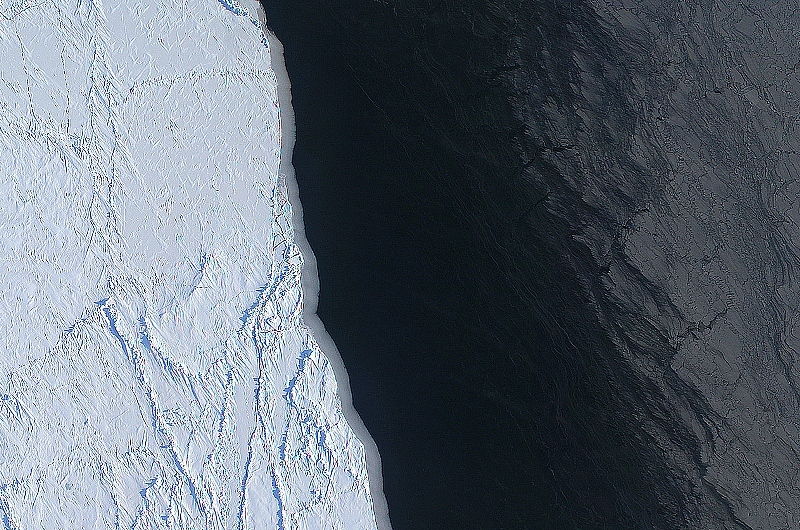 The image below, which is a DMS mosaic from Eric Fraim shows one of the many leads we saw from the NASA P-3 today with a variety of different types of sea ice. The rest of the day turned out very well indeed. The clouds that had worried the teams in the morning only formed only a thin band near the coast. 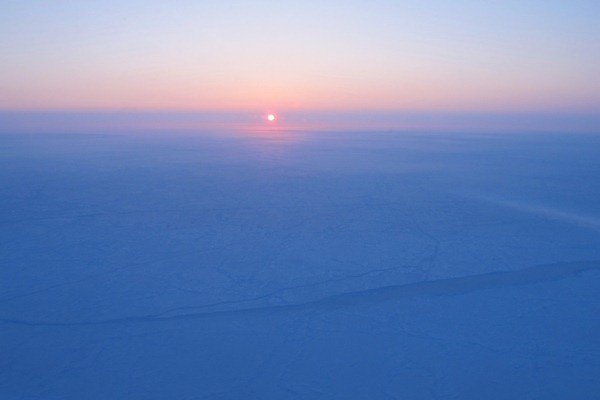 The rest of the line out on the ocean was clear and beautifully lit by the oblique Arctic Sun. All the onboard scientific instruments on both planes worked well so that by the end of the day it was clear that the day had been a success. By joining forces both the ESA and NASA teams collected a highly valuable dataset that will benefit the scientific achievements of ESA’s CryoSat and NASA’s future ICESat-2 mission to better monitor sea ice from space.